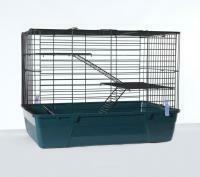 Rabbit / Rodent Cage LIBERTA CAGE This is the perfect indoor cage, for nearly all small animals. It is ideal for travel purposes as well, any rat, guniea pig, squirrel, chinchilla and other small animals would feel right at home in this lovely cage. The wire size is 2.3mm and 3mm and the bar spacing is 23.2mm. It has a colorful durable base and a nicely finished coated frame, with easy assembly.